The CSI EDGE™90 is a compact high-intensity tactical flashlight. Constructed of anodized aircraft grade aluminum, The EDGE™ outputs 90 lumens with 1 powerful LED. 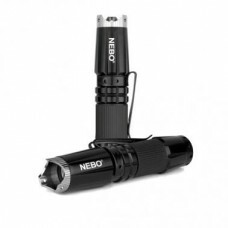 The water-resistant body design also features a steel clip to keep this flashlight handy, or gives you the ability to use as a cap-light for convenient hands-free lighting. The glow-in-the-dark button is positioned in the back so that you can keep constant control of the flashlight while activating the button. Small enough to fit in the palm of your hand, The EDGE™ shows off its tough side with the aggressive self-defense face. The aggressive face can be removed to have a smooth face. CSI EDGE™90…more powerful light, improved tactical design!